I have a NFV6. The piezo stopped working for my high E string so I bought a new saddle from Parker and installed it. Needless to say, I think I messed something up (which I usually don't do when working on guitars). Anyway I get no output from any string now. I tried to determine if I was getting signal at the input of the piezo preamp. When soldering, I noticed that all of the saddles connect to a metal strip that is at the back of the tremolo. But I didn't see a wire from the strip going out to the piezo pre-amp to determine if signal was getting there. Does anyone have any ideas or have a wiring diagram/schematic? BTW, Welcome to the forum.... Stick around! 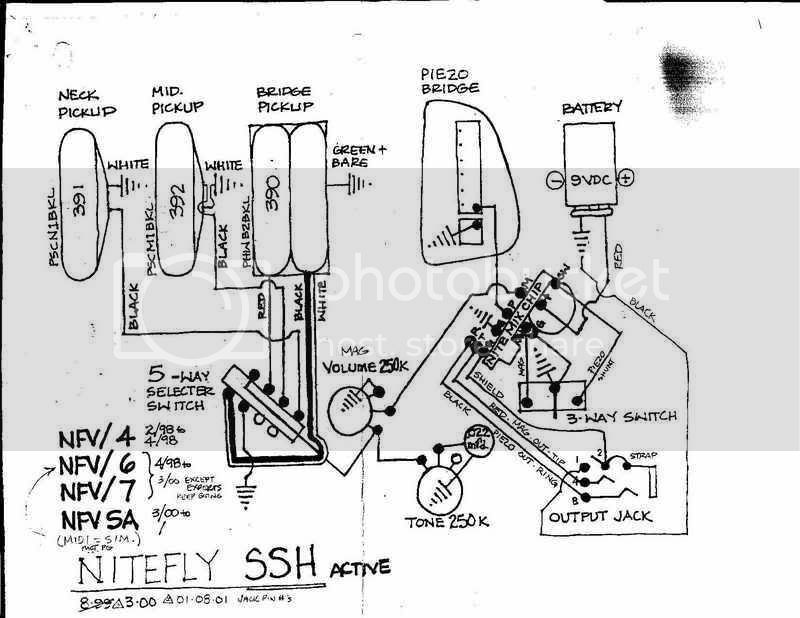 I got this diagram/schematic with a Nitefly I got last year and thought it might help. I wasn't sure what Jamie sent you but even if you were all set someone else might find this in a search that needs help. When soldering, I noticed that all of the saddles connect to a metal strip that is at the back of the tremolo. But I didn't see a wire from the strip going out to the piezo pre-amp to determine if signal was getting there. You might have mistaken the thin (really thin) coaxial cable that goes to the piezo preamp for a ground wire. It's possible that you have accidentally grounded (through a solder splatter probably) the hot lead of that coaxial cable when you were resoldering the new saddle.